Wednesday July 11, 2018: Nate puts Victor on notice, Sharon makes and admission to Mariah about JT, and Phyllis worries Billy is cheating. At home, Phyllis contemplates a frozen dinner since Billy’s working late. She decides she’ll surprise Billy with takeout, but Summer protests, “No, you can’t!” She lies to her mother that he’s trying to land a big deal to impress Ashley and can’t be distracted. She offers to take Phyllis to dinner. While Phyllis is upstairs, Summer texts Billy, who’s in a poker game at the Club and urges him to hurry. Phyllis reappears and Summer tries unsuccessfully to convince her to go to Top of the Tower instead of GCAC. At Sharon’s place, Nick gets a text to call Brittany. Sharon surmises it’s about Christian. Nick calls and learns there will be a ruling by day’s end in writing. He tells Sharon he’s certain Victor won’t be getting what he wants this time, but she’s still unsure. Nick notes his dad’s not the powerhouse he used to be if he let a loser like JT get the better of him. He has to go out and reassures Sharon she’s safe and they’ll get good news, before leaving. At the Dive Bar, Hilary and Mariah cut to commercial break and Hilary confronts Nate for laughing at their segment. They spar verbally until Hil goes back on air. Nate stands there grinning. During the bit on health, Nate weighs in vocally from the sidelines. Once again, Hilary storms over to square off with the doctor, who claims he was doing her a favor. Hilary introduces him to Mariah and leaves. Mariah laughs that Hilary’s protective of her show, but can surprise you…in a good way. Nate’s dubious. 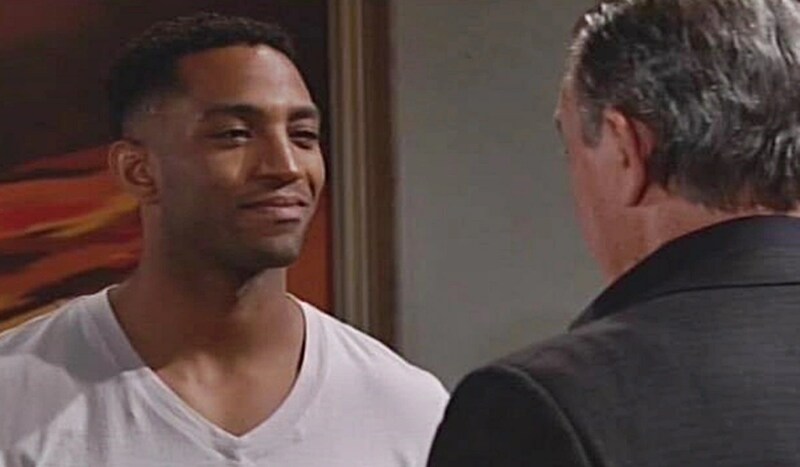 At the penthouse, Nate challenges Victor about cancelling his appointment with his physical therapist and postponing their visit. Victor had other priorities. Nate takes issue with this, and tells Victor it could be him that hits the ground next time, not just a glass of water. Victor needs to be strong for what’s coming and warns Nate if he doesn’t fulfill his commitment, he will need a doctor. After an examination, Nate feels Victor’s recovery’s taken a step back and insists he stick to the treatment plan. After seeing Victor off in the elevator, Nate sees Hilary exit her apartment. He realizes he’s locked out. She taunts him before leaving. Mariah joins Sharon at home to wait on the custody ruling. Talk turns to JT and Mariah says something’s been bothering her. She asks if JT was upstairs at Victoria’s on girls’ night. Sharon deflects, but Mariah persists, and knows her mother’s been off since that night. Sharon concedes JT was there that night and admits she helped him leave town. Mariah muses that she helped Victoria do it, and can’t believe Nikki let him go. Sharon claims they just wanted him gone. Mariah worries they’d have had to bash him in the head if he’d turned on them. Sharon warns Nick can never know about this. Mariah reassures her. At the Club, Summer tries to check her phone, but Phyllis wants her to put it away. Summer sends Phyllis to the kitchen to check if the corn fritters are cooked in peanut oil so she can text Billy for an update. Phyllis returns, and a man appears to ask Summer if she’s going to join the game upstairs tonight and mentions her friend is there. Summer cuts him off. Once he’s gone, Phyllis asks what he meant. Summer stammers that he was talking about a new video game, and Phyllis wants to go play. Summer sniffs about Phyllis wanting to ditch her. At the Dive Bar, Victor arrives and eyeballs Nick, who’s concluding a meeting. After, Victor muses that Nick must be confident about the ruling tonight. Nick hopes it doesn’t get leaked since someone has it in for Victor. Suddenly, they both receive emails, read them, and exchange a look. At home, Phyllis and Summer are glad to have spent time together. Phyllis is irked that Billy hasn’t surfaced on text. Summer heads upstairs and texts Billy, “How’s it going?” Phyllis grabs her purse and leaves. Summer comes downstairs later and messages Billy that she diverted Phyllis, he has nothing to worry about. Phyllis arrives at Jabot, which is dark, just as she gets a text from Billy saying he’s still at the office and not to wait up. Hilary meets a worried Phyllis at Crimson Lights, who questions if Billy’s cheating on her. Hilary gives her the number of a private investigator…just in case. At Sharon’s place, she tells Mariah that Nick must have gotten word by now. Nick appears and Sharon’s face falls. “You lost.” Nick reveals Christian is with him and says, “Welcome home, big guy.” The arbitrator ruled in their favor because his father was hiding his health issues and that Christian needed more.